The Wild Wadi Water Park is one of the many surprises that Dubai holds for its visitors. Consisting of various rides, wave pools and water slides, it is a popular destination both for families and thrill seekers alike. The Wild Wadi Water Park is located in Jumeirah, right beside the Burj Al Arab. Just like Burj Al Arab, it is owned and operated by Jumeirah International. The word “wadi” means oasis in Arabic, and Wild Wadi is designed to look like an Arabic oasis with lots of fun packed in its waters. • The Master Blasters. The Master Blasters are water roller coasters that are propelled uphill by using high-powered water jets. Riders on these Wild Wadi water roller coasters have the option of sitting on a single ring or a double ring. There are eight of these Master Blasters in Wild Wadi, namely: Falaj Fury, Flood River Flyer, Hos’N Hurler, Jebel Lookout, Wadi Basher, Wadi Leap, Wadi Twister, and White Water Wadi. • The Ring Rides. If the Master Blasters ride uphill, the Ring Rides are downhill gravity slides that go down on high speeds. Riders here can also sit inside a double ring or a single ring. There are seven of these Ring Rides in Wild Wadi, and these include the Falcon Fury, the Rushing Rapids, the Thunder Rapids, the Tumble Falls and the Tunnel of Doom. • The Family Ride. The Family Ride is a two-part ride. Riders first go through the Summit Surge, where they will be blasted uphill right into a pool area. Afterwards, they will be taken on a downhill slide that is 170 meters long, known as the Rushdown Ravine. • Juha’s Dhow and Lagoon. This is the place in Wild Wadi where the rides and games are focused on the young children. Among the 100 rides and games that can be found here are water cannon shooting, water guns and other interactive water fights. • Juha’s Journey. Juha’s Journey is a long river that stretches 360 meters around Wild Wadi, where people can just float lazily around the water park as they please. • Flow Riders. There are two Flow Rider rides in Wild Wadi: the Wipeout and the Riptide. Both are surfing simulators that allow riders to body-board, knee-board or even surf the wave. • Breakers Bay. The largest wave pool in the Middle East, Breakers Bay gets tons of water splashing over the riders in five different ways. 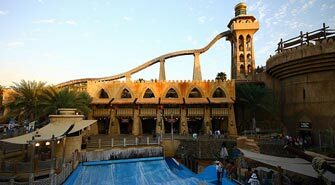 The highlight of Wild Wadi is the Jumeirah Sceirah, which is the tallest free-fall water slide outside of North America, as well as the fastest. It rises up to 33 meters and it shoots up its riders to a speed of 80 kilometers/hour before letting them plummet down. Wild Wadi Water Park in Dubai is one of the best places to go on a holiday for the very fun and thrills it gives.